As a boutique luxury Corfu villa business, we’re committed to making your Corfu villa holiday unforgettable. 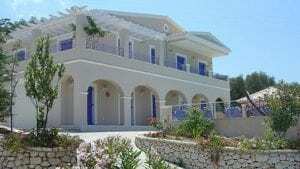 Villa Julia and Villa Andrea are unmatched and both are located close to the picturesque harbour of Kassiopi, on the spectacular Northeastern coast of the Ionian Island of Corfu. Each is set in acres of private gardens, with sea views, endless terraces, private pools and five double bedrooms. Perfect for friends, families and couples who want to get away from it all, you’ll find your own slice of paradise on our beautiful island. With a single focus on our exclusive properties and a desire to offer a bespoke, flexible and personal service, you’ll be treated to a five-star experience from beginning to end. We’re passionate about helping our guests find their perfect Corfu villa holiday, to relax and unwind, and make the most of their escape from the hustle and bustle of daily life. If you want to slow down and simply be, to free your mind under the shadow of a palm tree and let your spirit soar, you’ll find our additional services leave you with nothing to do but trail your toes in the pool and tilt your face to the sun. From a daily maid service to a personal chef cooking up local delicacies and delicious feasts from fresh produce, you can tailor-make your stay to suit you and your party’s needs. Just a few minutes away from the villas are a host of local attractions, traditional whitewashed villages, a small water park and mouth-watering tavernas. Whatever your tastes, we can help you to plan your trip to suit, from food heaven to beach bound, natural wonders to a taste of the authentic Corfu. The house was all you said it was and the views were ‘to die for’. We did not expect such a perfect location for our stay in Corfu. The people were so friendly completely different from our experiences in Spain. A short note to tell you that we had the most amazing holiday at Villa Julia; it lived up to all expectations. The bedrooms are a very nice size and comfortable and the pool and outside areas are fantastic!! Great kitchen.